Lush Fab Glam Inspired Lifestyle For The Modern Woman: Stunning Black & White Home Decor. Stunning Black & White Home Decor. Planning a fabulous home makeover for spring? 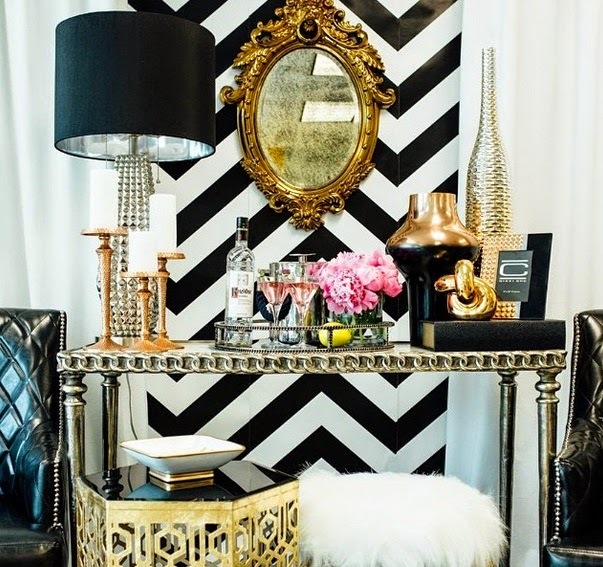 We are currently crushing on the luxurious look of black and white home decor. It's the perfect way to make large spaces feel intimate and transform small spaces into luxurious pads. Plus black and white can be combined with any pop of color to reflect the changing seasons and brighten up the look. 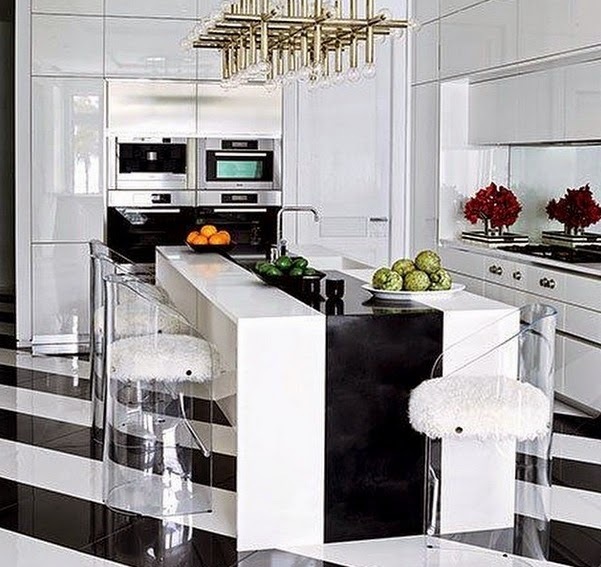 Read on to be inspired by some of the most spectacular foyer, kitchen, bedroom and more in black and white chevron print, stripes and the black and white theme incorporated onto the walls, floors, furniture and home decor with an impeccable sense of design! Look 1: This look is perfect for a foyer or reading nook, the black and white chevron stripes backdrop is an eye-catching feature that adds pizzazz to the space. Look 2: You will certainly love heading into the office everyday if your work space looks like this. For those who have the pleasure of working from home, this is the perfect office to inspire you. 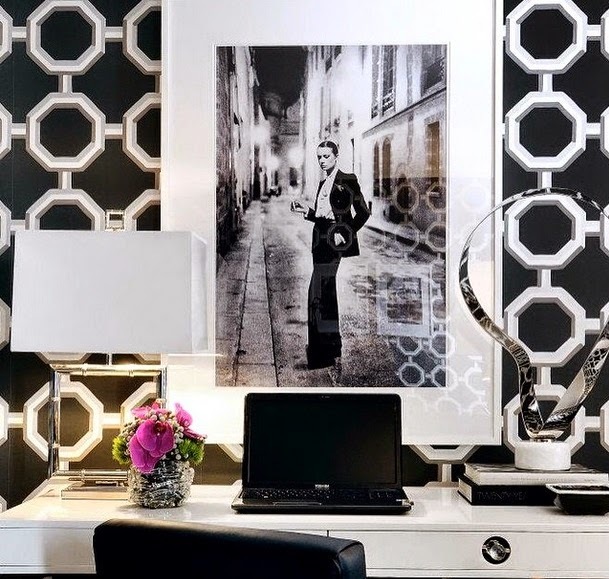 White decor, reflective surfaces and a bold graphic print black and white wall paper is all you need to turn your home office into a luxurious space like this one. Look 3: This beautiful and modern all white kitchen is made even more luxurious with it's black and white asymmetric stripes floor tiles. It's the perfect way to ground this open space. 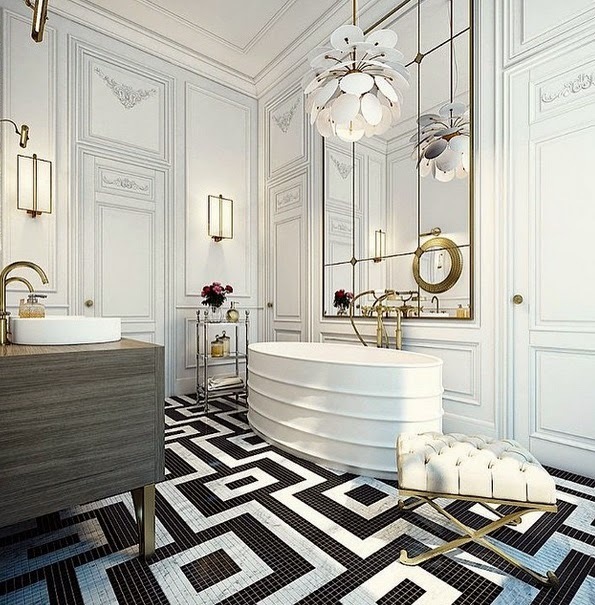 Look 4: The stunning architectural features and over-sized decor in this massive home spa bathroom is given the warmth and intimacy it needs with miniature sized black and white tiles laid out in a square graphic pattern. It looks grand and absolutely fabulous! 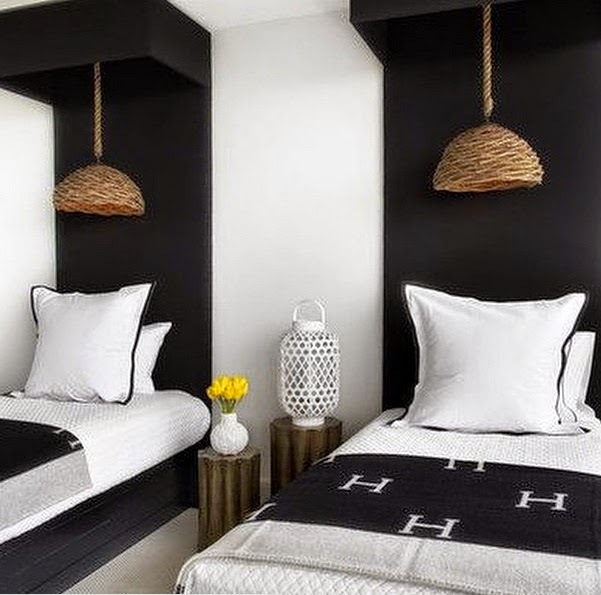 Look 5: Black and white is also a fabulous palette for a kids room or spare bedroom/guest room. Make it fun for a kids room with home decor and accessories in bright colors like yellow or fuchsia. Make it relaxing and luxurious for a guest room with metallic shades in gold and silver combined with softer hues of blush pink and peach. Get The Look: Below are some of our favorite black and white home decor and home accessories to help you turn your space into a luxurious one that you will love spending time and hosting in. 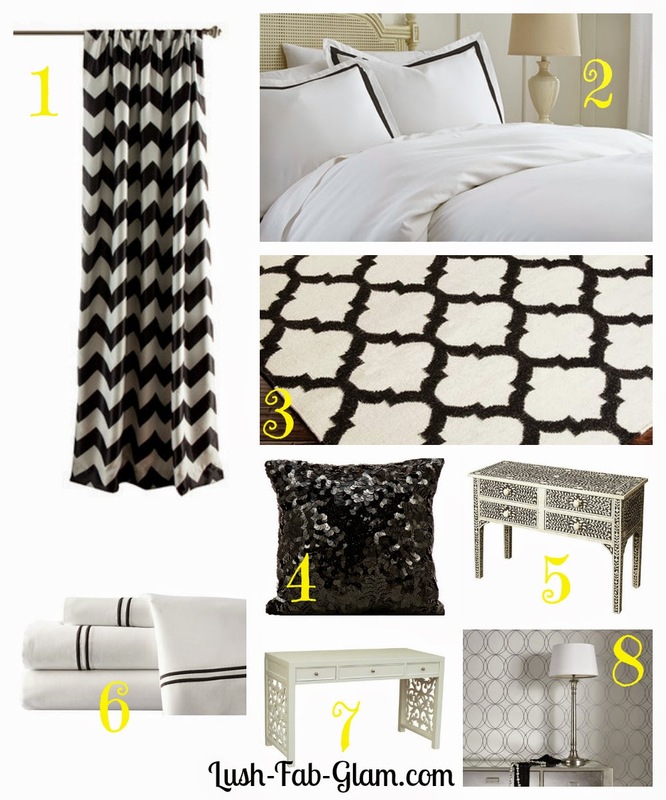 Are you a fan of black and white home decor and which look is your favorite? Share with us by leaving a comment below. I completely love the black and white home decor! I want to make my home office like this. I think it just makes the room more spacious and super chic. Love these ideas! Hi Melissa, the black and white decor is perfect for your office! Share your before after photos with us once you're done! Look 1 The black stripe wall paper, carved mirror, the gold side table and lamp shades are all different styles but there is harmony.